If you didn't know, now you know that it's a party and the DNC is jumpin. 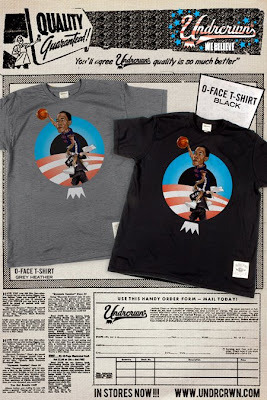 Election season is runnin ever so high and Undrcrwn is involved with their support of Barack Obama. In the video below, you can spot Spike Lee rockin the O-Face t-shirt as he's being interviewed by MSNBC. Even Nas is rockin the shirt. I believe the hip-hop contingency will be sportin this very soon! There'll be a general release in the very near future. However, if you gotta have it now, check out The 400's website and purchase it there. They'll be shipping out the shirts immediatley out of Denver. Otherwise, if you got a bit of patience, you can order it from the Undrcrwn site and they will be shipping the shirts out next week.